For those who don't know, a Cruise Ship Terminal is a place where cruise ships have a designated docking area, just like Port Authority, the bus terminal. It works the same way. At the moment, improvements are in store for the Red Hook Cruise Ship Terminal. The new Terminal will allow the cruise ships to "plug-in" to the city's electric grid, instead of running the engines all day long. The plan for redesign was set in motion by Congresswoman Nydia Velazquez to reduce the air pollution caused the cruise ships. As of early July 2009, the Congresswoman officially secured $2.85 million in funding for the new Cruise Ship Terminal! Hopefully this will lead to a better environment and way of life in Red Hook. For more information about air pollution in Red Hook and its repercussions, look up the BQE on the Red Hook Green Map. 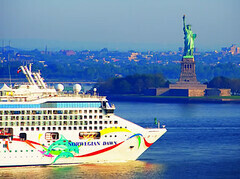 Here is a nice view of a cruise passing by the Statue of Liberty.